Girls Softball hitting league future dates are coming! Hitting leagues and competition such as this have a lot of benefits to all that participate. From the 9 year old little leaguer playing softball/baseball, to the high school players, or adults who like to have fun and compete. *Hitters get put into pressure situations they will face in games in front of spectators. *Iron sharpens iron. The more you see good swings the better you get. *Opportunity to network and meet new people/friends. Cost: $25.00 per player or $100.00 per team. 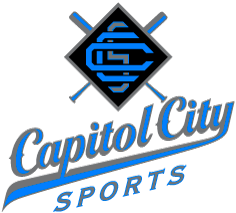 Teams participating must have fee turned into Capitol City Sports no later then the Tuesday that proceeds their competition date. If not received, team will be removed from competition and a “waiting list” team will replace that team. Call to get your team name pre-registered. Participants: 15 Teams of 4. Double elimination. Last team standing is the Champion! Prizes will be awarded to the winning team. Event Duration: Teams should plan on a fun night lasting approximately 2 1/2 hours. All pitchers are volunteers. Pitchers will soft toss approximately 15 feet from the hitter. Volunteer is also the umpire throughout the game. Umpires decision is final!! Teams will play in five 20×30 cages. Ceiling height of 13 feet. Yellow rope inner twined through the netting will create the field. Two yellow ropes woven vertically on opposing side walls will separate fair from foul. A yellow rope will be woven horizontally from foul line to the other foul line at 4 feet off the floor. This rope will decide outs from base hits. Hitters will start off with ONE strike. Definition of a foul ball: Any ball that strike the netting before the vertical foul rope. Hitters will be allowed 3 foul balls. The fourth foul is an out. Definition of a fair ball base hit: Any ball hit above the horizontal rope and in front of the foul rope that does not hit the ceiling screen. Definition of Extra Bases: Doubles will be awarded to hitters that successfully strike Green 1’x 16″ sign marked”Double” in the middle right and left part of the back screen. Triples will be award to hitters that successfully strike the Orange 2’x3′ sign marked “Triple” in the upper left and right corner part of the back screen. Home Runs will be awarded to hitters that successfully strike the Blue 10″x14″ sign marked “HR” in middle upper part of the back screen. Definition of an Out: Any ball that strikes the ground in fair territory. Or any ball that strikes the ceiling netting in fair territory. Or any ball that strikes the netting in fair territory below the yellow horizontal rope. Any player that fouls off more then 3 balls, on the 4th ball the hitter is out. Definition of Competition: Teams will compete against other teams in their age group. The winner will be decided by 3 games, five innings a piece. The team with two wins after completing all 3 games will be the winner. All three games will be played no matter the record after the 2nd game. This event will we will be using the traditional 15 team, double elimination bracket system. Please feel free to email info@ccssalem.com or call (503) 967-7212 to find out more information. Each team needs to fill our our waiver prior to coming in for the hitting league.